Well, it's official. Christmas Break has come to an end. Grant returned to his regular work week, with no vacation days in sight. 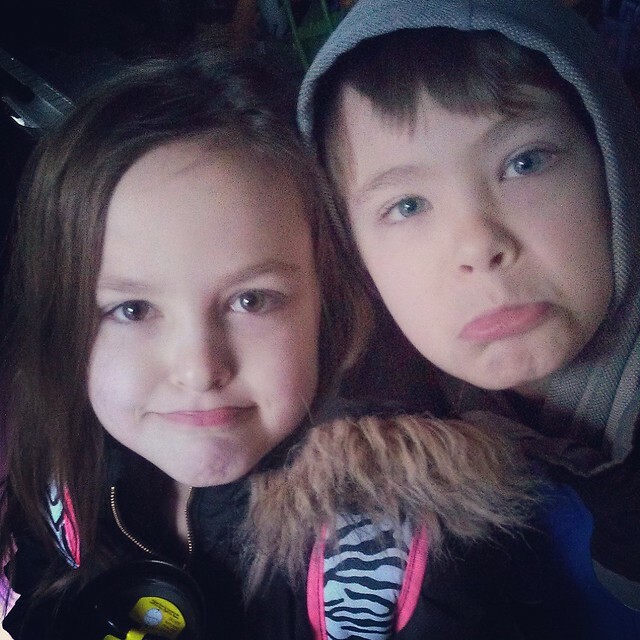 Dylan and Lexie headed back to school today, after 17 fun-filled days of Christmas vacation. Liam started therapy again, after taking a week off. Christmastime is so magical, and now everything seems so blah! We're all feeling a bit bummed! We spent most of our time together with family and friends. We did something almost every single day. We stayed up late, and we slept in. We kept busy, but also enjoyed a more relaxed schedule. It was glorious!!! 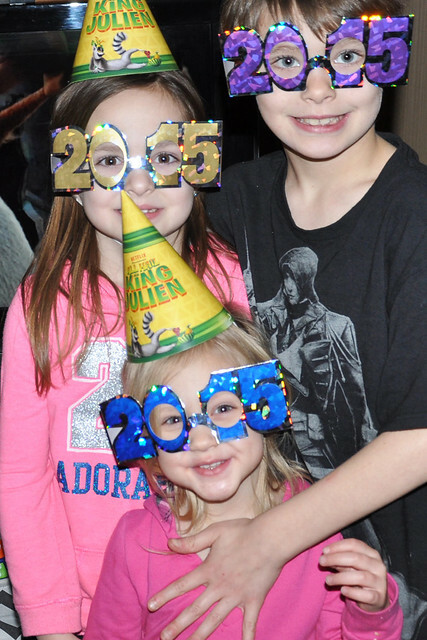 Despite feeling bummed about the end of the holiday season, 2015 is off to a great start! I never make resolutions. I just think of the new year as a fresh start, and I aim to make positive changes. This year, I'm all about simplifying things and staying organized. I have so many items on my to do list, but not enough time to tackle those projects. I decided to break those big projects down to small, manageable projects. I'm trying to tackle one mini project every day. So far, so good! I'm currently tackling the kitchen. I'm going through one drawer or cabinet each day. I'm getting rid of stuff we don't need and finding ways to organize everything so it's easier for me to find what I need. After this room is done, I'm moving on to another room. I already made some positive changes that made my life just a bit easier! Another change is that I'm making exercise a priority again. Once the kids went back to school, I really started slacking. I was doing so well with T25 and walking/running several times a week. I felt so good, and I was in great shape. Then, the busyness of back to school, followed by all the holidays, took over. I'm definitely feeling more tired and grumpy, so I firmly believe it's from the lack of regular exercise! Once it's warm again (or I replace my treadmill), I'm planning on running 3 times a week. In the meantime, I started Piyo. I love yoga and pilates, so I figured I would give it a shot! I tried it for the first time today, and loved it! I don't think it's going to be too hard to stay focused. T25 was definitely more difficult, and I completed that, so I can do this! Just for the record, I don't diet. Period. I eat a healthy, well-rounded diet, but I'm not afraid to have a handful of chips or a piece of cake. I believe in regular exercise and eating everything in moderation. It never failed me before! Liam started the year with a new tooth. Last night, we noticed another tooth breaking through. Apparently he's going to do this all at once now! Despite the ticked off look in the photo below, you wouldn't even know he was teething. He's just so happy all the time! We went over to my friend, Jocie's, house on Saturday night for the playoff game. 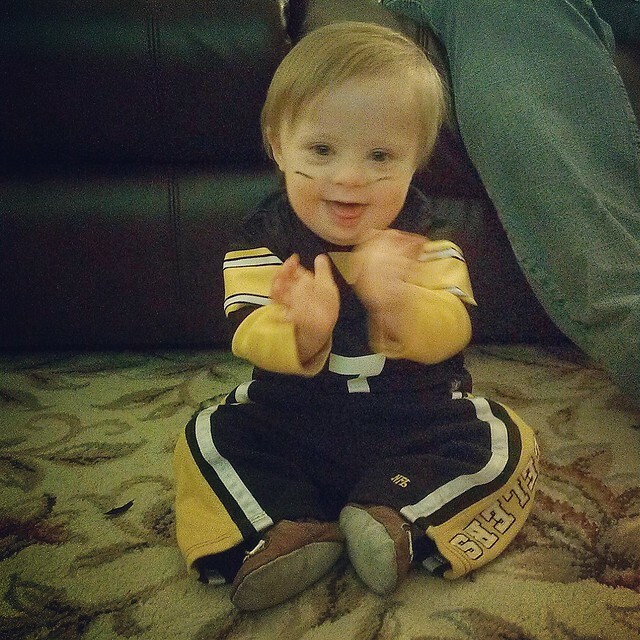 We cheered on the Steelers, but sadly, it didn't go too well. Although the loss was disappointing, it was a great season! Plus, hanging out with great friends helped to soften the blow! My kids got a lot of gift cards for Christmas. Although they spent a lot during our day after Christmas shopping extravaganza (aka ULTIMATE stress), they still had money left. I had to go to Kohl's yesterday before my Kohl's cash expired, so guess who accompanied me? We conquered 4 stores in less than 2 hours, including logging in some time in the Kohl's dressing room. The kids were REALLY good, and everything went well until Liam goosed the lady in front of us at the end of our shopping trip. Luckily, she thought it was funny! 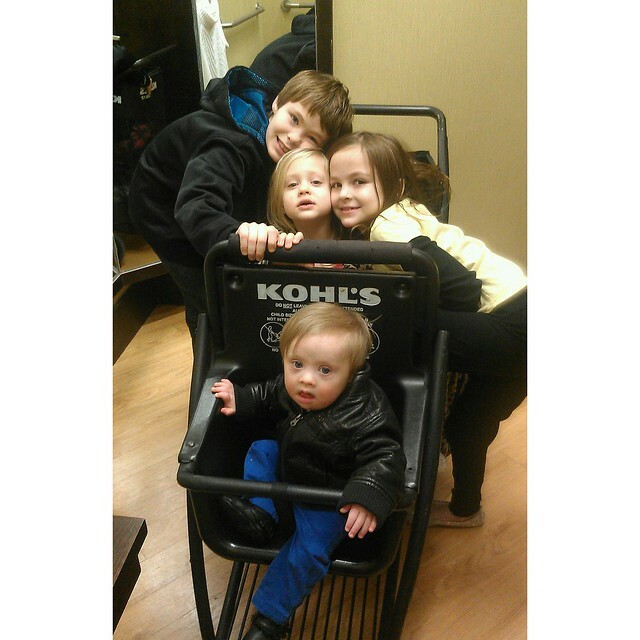 I don't feel like a supermom often, but when I can take all 4 of them shopping alone, and make it out with minimal stress, I feel like I can do anything! They really are good kids! Our Christmas decorations are still up, but I couldn't resist some Valentine's Day items. Target gets me every time!!! On that note, my Christmas posts are coming! I've just been busy over the past 2 weeks. I do, however, have 3 posts lined up! 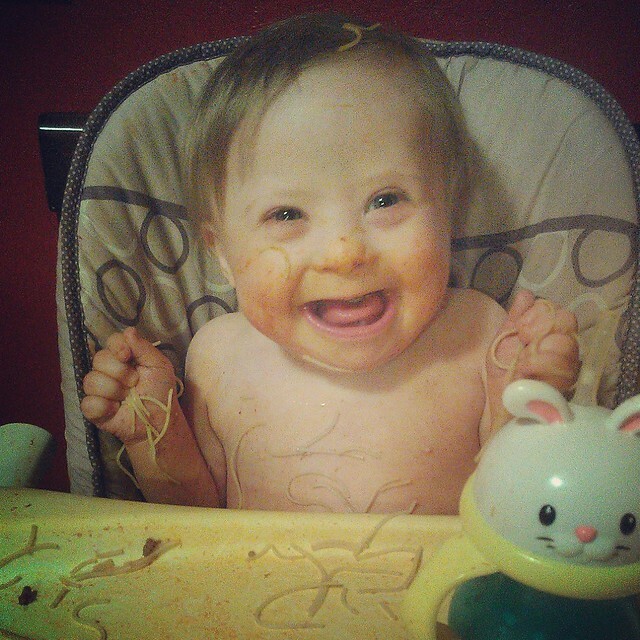 We ended our last day of Christmas break with spaghetti night. One of us was VERY excited! 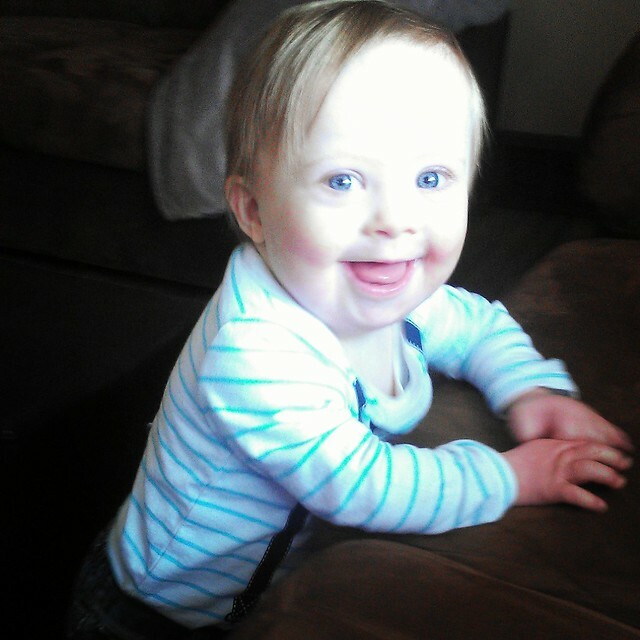 Liam had his weekly OT session this morning. His Early Intervention coordinator joined us to do his quarterly review. 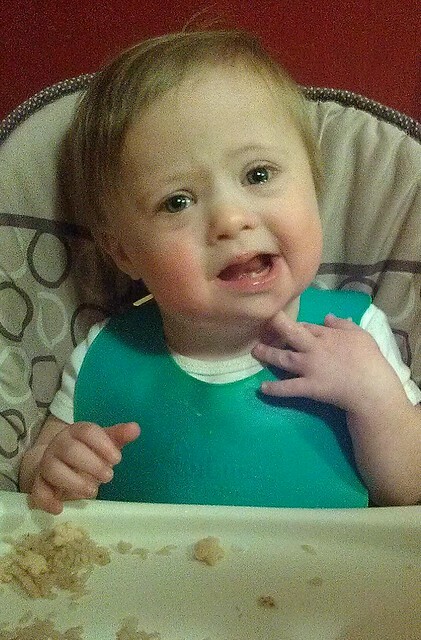 Liam reached ALL the PT goals that were set 3 months ago, and reached or almost reached all his OT and ST goals. Which means his therapists are adding a bunch of new goals! We are so proud of this little guy! The cold weather returned to Pittsburgh today, after an unusually warm December. It's freezing right now (like 20 degrees! ), and is only going to get colder over the next few days. Winter is officially here! I refuse to fall victim to the winter blues, so we're filling up our calendar with lots of fun parties and playdates! The only plus of time flying by is that winter will fly by, too! You have it so under control. Love reading your blogs. Inspires me to do more. I try, but not all the time. Thank you! Looks like a great end to your year! Loved seeing your IG today that Liam reached all his goals and bigger clothes! I love baby clothes and just bought Ethan some 24 month sets with reindeer on the bottom for next year. Can't wait to see all your Christmas pictures. Ahhh, back to the grind is right!! I have heard great things about Piyo - I did T25 and LOVED it...I may try it at a very low impact while pregnant because I need to do SOMETHING. I feel so sluggish! Sorry about the Steelers...now we have to face the Ravens on Saturday!! 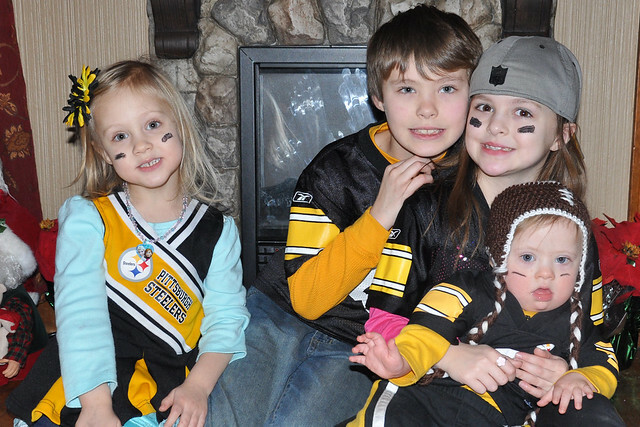 I am definitely not a Steelers fan, but you have some pretty cute fans on your hands!! I hope you gave Piyo a try! I love it! Such a bittersweet time. I am ready to get back into a routine, but am going to miss having everyone home. It's hard to send them back! Gotta love our Pittsburgh winters!!! Looks like you and your family had an amazing Holiday season!!!!!!!! 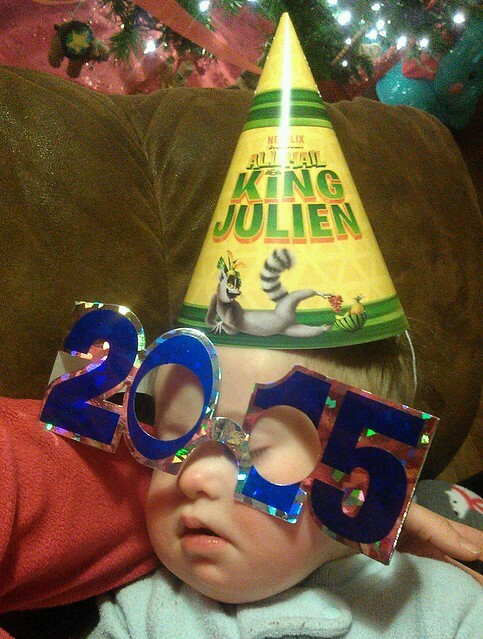 Bring on 2015 to the Burgh! Haha! It's freezing right now! I'm ready for Spring! I'm with you! After Christmas every year I struggle with the winter blahs. Hang in there! Thanks! I've kind of gotten over it now that Spring is a bit closer!